In bid to expand perception, the brand and agency Critical Mass make clever use of Google data. NEW YORK: Pine-Sol is out to polish its reputation. Mostly known to work on floors, the brand wants to prove that its product is multi-purposeful, and to do so it’s turning to YouTube. YouTube divides its billions of videos into 26 categories, and Pine Sol has created 19 unique spots corresponding to the 11 most popular ones. The idea is to show people ads that relate closely to the content they’ve chosen. Pine-Sol partnered with creative agency Critical Mass for the campaign. 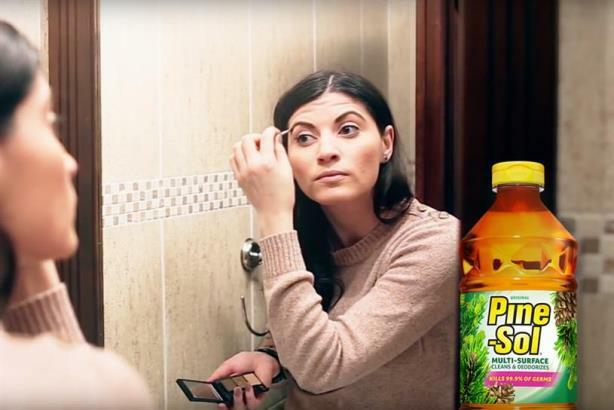 According to Jared Folkmann, the agency’s group strategy director, "People don’t know that Pine-Sol can clean your clothes, counters, bathrooms, etc." Folkmann and his team went to Google to determine which categories came up the most when users searched for related keywords. "We wanted to ensure we had a video for the most popular search in every category on YouTube," said Folkmann. "Rather than limiting our message to what you would expect such as home or the how-to categories, we could get closer to their interests by being relevant." After collecting the data, the Critical Mass team landed on 11 categories, including advice, comedy, cute animals, health and fitness, makeup tutorials, movie trailers, fashion, music reviews, decorating, and sports. Each 16-second video has an overarching message — that the product can’t predict what’s going to happen in the coming video, but it knows it can clean whatever is there. Each video focuses on subjects that draw followers to each YouTube category, and each one highlights a different object that the product can clean. In Date, one of the videos tailored to the "makeup tutorial" category, a woman puts on her makeup while looking in a mirror getting ready for a date. A voiceover says "We don’t know if it will work out…but we do know how to clean that sink she’s in front of." In Chad, a spot meant for YouTube’s "sports" category, a man works out at the gym wondering if the guy before him cleaned the machine he’s using. The voiceover says, "We don’t know…but we do know how to clean his gym clothes." Folkmann said the brand had "never been this targeted with their products before." But as a small brand, Pine-Sol didn’t have the funds to create videos for all of YouTube’s 26 categories, so it decided to make due with 19 videos representing 11 categories. Still, according to Folkmann, the process was easy and affordable. "The videos are actually stock footage so we didn’t have to spend a lot of money," he said, "and once we had the formula, they didn’t take that long to make."